I really wish that Google Maps had uncovered the existence of the Loch Ness Monster. Like most unreasonable people, I want to believe that there are creatures like Nessie and Bigfoot out there, just waiting for us to stumble across them somehow. 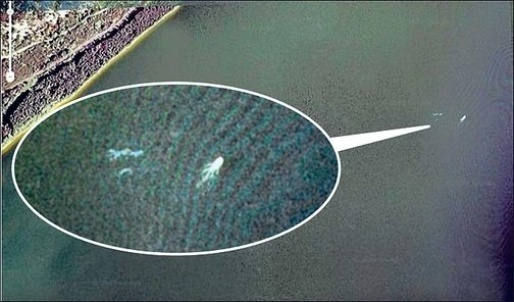 The images that everyone says might be Nessie? Sadly, it’s just a boat and some wake. Believe me, nobody wants it to be Nessie more than I do, but this isn’t some grainy footage of Bigfoot on a walk. This is pretty much exactly the outline of a boat as seen from above. No question about it in my mind. Grabbing onto any scrap of evidence is why most people are so quick to dismiss anything even remotely unusual as coincidence while those of us who are open to other realities are dismissed as crazy people. This is why the government has no problem covering up UFO sightings and the Roswell crash; if you’ll believe anything, then obviously you’re a nut and any valid points you make regarding the existence of anything supernatural or paranormal is the delusional raving of a madman.